Mountain hydrangeas are the least common mophead (macrophylla). These shrubs are native to Japan and are deciduous. Hydrangea serrata grow in zones 5 to 9. Mountain hydrangeas are typically smaller and more compact than other mophead hydrangeas. The leaves are dark green and serrated like other macrophylla. The leaves are commonly used in tea, as they contain a natural sweetener phyllodulcin. The tea is known as sugukcha in Korea and amacha in Japan. Amacha is used in Japan to celebrate Buddha’s birth. A common name of this tea is tea of heaven. The flowers are closer to lacecap hydrangeas, with smaller florets in the center surrounded by larger florets. The blooms are either blue or pink depending on the acidity of the soil. The flowers will be blue in higher acidic soils and lilac to pink in alkaline soils. These go great for accent plants in protected areas near homes or on patios. These hydrangeas can grow from full sun to partial shade. The soil needs to be moist and nutrient rich, but has to be well-drained to prevent root rot. Be sure to plant these with some shelter to wind that can dry the soil out. For more information on check our our complete hydrangea care guide. If you prune mountain hydrangeas, be sure to prune either after flowering to cut back stems, or cut back and remove dead and winter damaged stems in the spring. 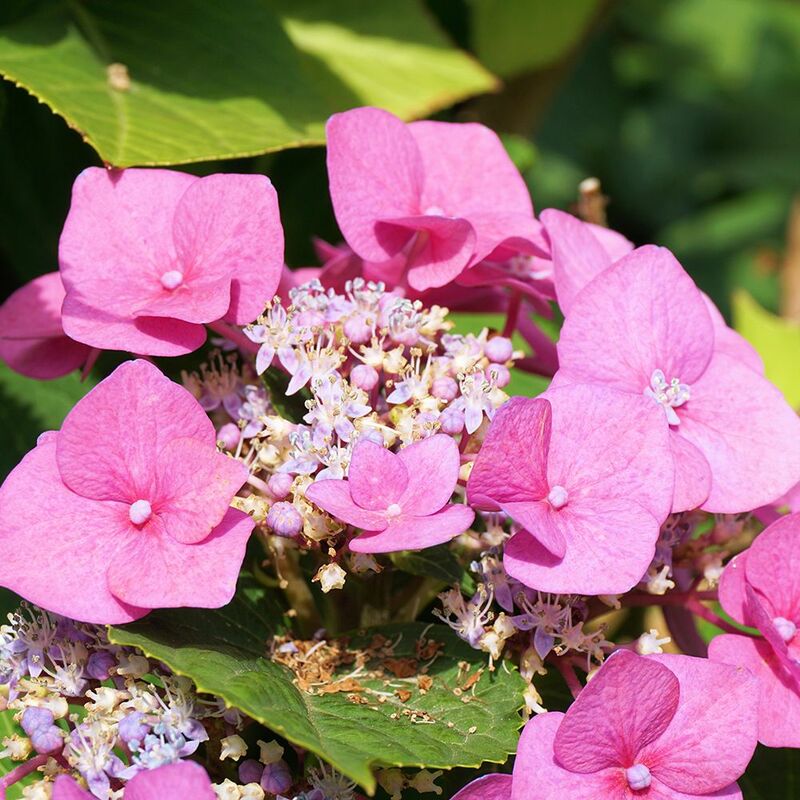 For more info check out our hydrangea pruning guide.